England 7-294 (Kevin Pietersen 113, Alastair Cook 62, Ian Bell 60, Mitchell Starc 3-75) trails Australia 7-527 declared (Michael Clarke 187, Steven Smith 89, Chris Rogers 84, Graeme Swann 5-159) by 233 runs. The Aussies declared their first innings after a mammoth score of 7-527 in the first innings and the Englishmen reached 294 in 120 overs with three wickets remaining. 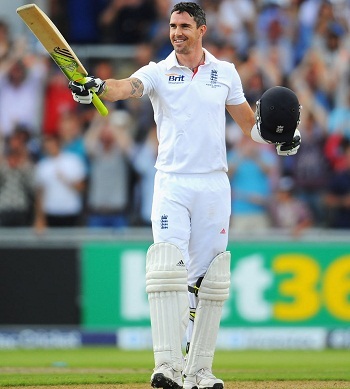 The third day’s play of the 3rd Investec Test came to an end on Saturday, August 3, 2013, at Old Trafford, Manchester. Earlier, the hosts went into bat at 2-52 after 30 overs whereas Alastair Cook and Jonathan Trott were at the crease for 36 and 2 runs. They entered the field with a defensive game plan and scored just 10 runs in the first eight overs. Trott was caught by the Australian skipper, Michael Clarke, at second slip off Ryan Harris for 5 off 32 balls and was replaced by Kevin Pietersen. Cook hit the first four of the day two overs later and completed his 31st Test fifty in the 41st one while his partner got 1 four in the 42nd over. The pair was unable to hit another boundary in the next five overs as Pietersen hit two consecutive fours in the 48th over whereas the screen displayed a hundred runs in the 50th one. The score was taken to 110 when Alastair Cook was caught behind by Brad Haddin off Mitchell Starc for 62 from 177 balls with 7 fours. Ian Bell walked in next and opened his account with a boundary while Pietersen carried on consolidating at his end. The later dispatched two back to back sixes off Nathan Lyon in the 63rd over and achieved his fifty. 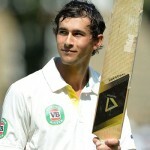 Bell opened his arms by hitting a six and accumulated eight runs in the 70th over with 2 fours. The batsmen remained watchful and kept the score board moving as Ian Bell attained his 37th Test half century in the 86th over. The score was enhanced to 225 in 90.2 overs when Bell was clean bowled by Harris for 60 off 112 deliveries with 1 six and 10 fours. Jonny Bairstow joined in with Pietersen who was gradually moving towards the three figures and finally accomplished his 23rd Test century with a four in the 96th over. 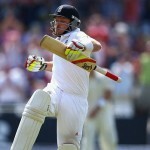 Bairstow was providing a supportive role to his senior partner but was gone for 22 runs as the score touched 277. Kevin Pietersen followed him three runs later when he was declared leg before wicket off Starc for 113 from 206 comprising 2 lofty sixes and 12 fours. Matt Prior and Stuart Broad saw the day off as the home side managed 294 runs for the loss of 7 wickets at the end of the 120th over. 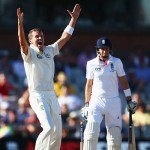 Mitchell Starc was the supreme bowler with three wickets whereas Ryan Harris and Peter Siddle shared two each. England is still at a first innings deficit of 233 runs and will bank on the present duo at the crease to minimise the margin whereas Australia will try to rip through the tail at the earliest.